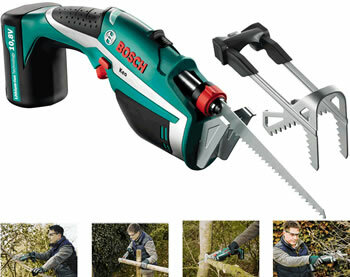 The Bosch Keo Cordless Saw provides effortless cutting giving versatile help around the house and garden. 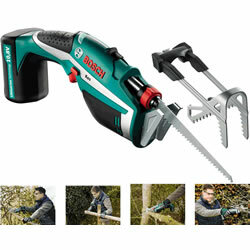 Simply squeezing the trigger cuts branches up to 80mm thick. Enables 30 to 190 cuts per battery charge. The detachable "A-Grip" provided holds branches in place during cutting - no second hand required. There is no memory effect and no self-discharge thanks to lithium-ion battery technology. Electronic Cell Protection (ECP) protects the battery cells from overheating.